Home / Kentucky Derby Party! 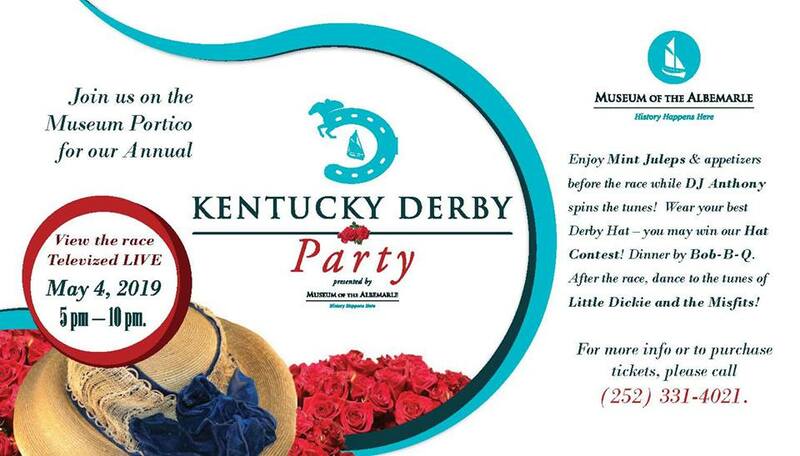 Join us at the Museum of the Albemarle on Saturday, May 4, 2019, for our Kentucy Derby Party! Enjoy Mint Juleps & appetizers before the race while DJ Anthony spins the tunes! Wear your best Derby hat - you may win our Hat Contest! Dinner by Bob-B-Q. After the race, dance to the tunes of Little Dickie and the Misfts! Ticket prices are $25 for current FOMOA members / $30 for nonmembers. Valid forms of payment: cash, check, credit card. You may also follow this link to purchase tickets online through EventBrite. For more information please call 252-331-4021.